So what does the Tablet Computer have to offer us today, and is it worth all the hype? Can something like the iPad really bring a new dimension to the CAD / BIM industry and the architect’s design workflow, from simple 2D drawings to complete virtual experiences? What is the future of “untethered” design via the Cloud and its companion, the Tablet? In my previous ArchiMAG article (isuue 3/2011), “iPad : the Lord of the Tablets”, I talked about how the iPad is viewed to users and business professionals today, and why it’s considered to be a separate category of computing in the “Post-PC” era with the magical user experience it provides. Many tech enthusiasts, like myself, believe that the introduction of the first iPad was most certainly a game-changer in the technology landscape, though the release of the iPad 2 brought even more shivers down our spines, by raising the bar yet again. The update was especially important for graphic geeks and design professionals alike, with 9 times faster graphics performance and double the CPU, bringing extra power to process complex drawings and 3D environments. This type of multi-touch device can prove beneficial in many fields, but especially in the AEC industry; from sketching & annotating drawings, to providing a more interactive user interface for viewing & editing 3D models, playing with different lighting and material options, or just navigating through CG environments. Imagine “pinching” & “flicking” through a virtual space or actually walking on site to navigate an augmented reality environment - creating a much more “natural” experience for the architect and client - or even editing LIVE models right from the building site while directly connected with the design team back at the office via the Cloud. The possibilities are mind-blowing, but most certainly not beyond our reach! While many of the apps here have been developed for Android tablets as well, this article will focus on some iPad apps that have been developed for architects, designers and other professionals in the AEC industry. Many of us have probably used an iPad at some point as a replacement to our design portfolios, while showing off a great amount of images and drawings at a meeting or even just at the bar with friends, but there's got to be more to it than that, right? Well, some Apps in the Store have already started to show the power of the iPad in the design process, from viewing 3D models with iRhino 3D, SightSpace 3D, or 3DVIA Mobile, drawing & photo-editing with Brushes, Adobe Eazel or Photoshop Express, 2D CAD drawing with SitePAD, FingerCAD HD, Turboviewer, or GraphPad, and even full 3D modelling with Verto Studio 3D, to name a few. 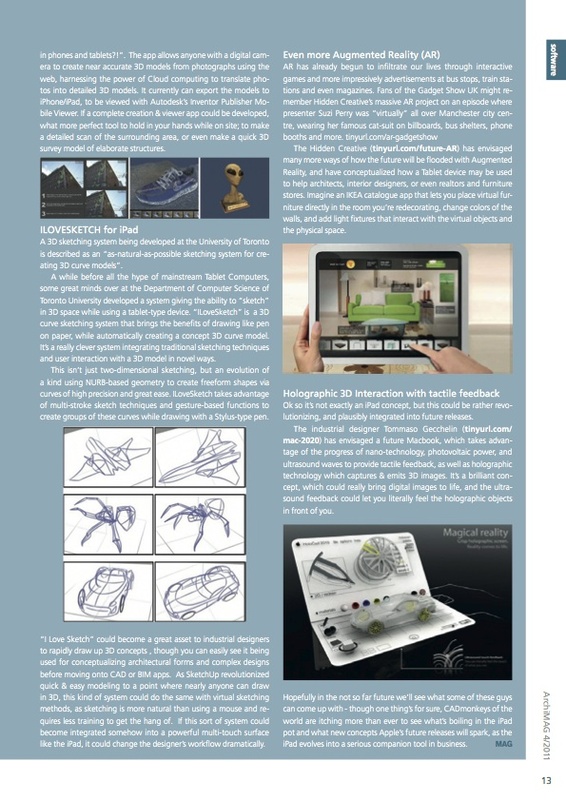 Autodesk has been stealing the show for a while on the iOS front, with Sketchbook Mobile (paint and drawing), 123D Sculpt (quick and easy 3d modelling), Autodesk Design Review (review and annotate DWF models), Buzzsaw Mobile (project document viewer), Bluestreak (real-time collaboration), Inventor Publisher Mobile Viewer (3D assembly instructions viewer) and especially Autocad WS, which has registered over 2 million users online with around 4 million drawings uploaded. Some other major companies, however, are finally catching up and joining the front-line with some amazingly innovative apps, such as Graphisoft’s BIMx and Abvent’s iVisit 3D. The "Cloud" seems to be yet another new word buzzing in our ears more and more, and large enterprises such as Apple, Microsoft, Google and Amazon are investing millions of dollars approaching this new technology. It’s an innovation on a similar level to jumping from basic 2D & 3D CAD to full blown Building Information Modeling (BIM), fundamentally changing how buildings are designed. I'm not going to get into the intricate details of the Cloud, that's beyond my reach, though it's not such a difficult concept to grasp; most of us have probably used some type of this tech at some point, like Gmail, Google Docs or Dropbox. Going a step further is the concept of Chrome OS or iCloud, but even BIM Server, Graphisoft's valiant effort to efficiently develop and expand open design collaboration via the Cloud. Essentially it has the ability - with the Tablet Computer as its companion - to reshape AEC workflows and “untether” us from the shackles of the office to design and collaborate freely from wherever we want. 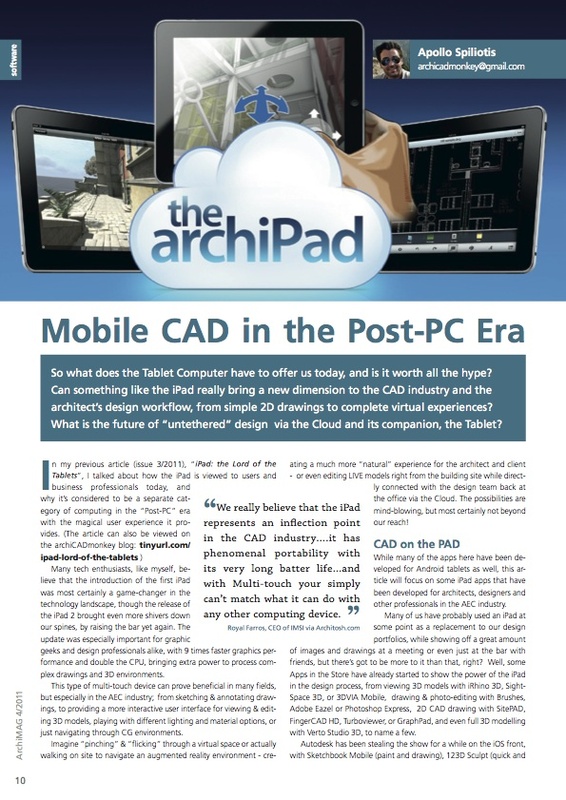 One of the most viewed posts on the blog is an old post from Feb 2010, posing the question if we’ll ever see a version of ArchiCAD on iPad, or even more plausibly something similar to Virtual Building Explorer, to provide real-time 3D navigation and enhanced understanding of ArchiCAD models. Well, I’m sure we’re all excited by what is probably one of the most anticipated architectural apps for iOS,Graphisoft’s BIMx! Like its VBE predecessor, it’s basically a 3D model viewer in an interactive environment with intuitive game-like navigation, but with a few tricks up its sleeve. It allows anyone to view and explore BIM models (exported from ArchiCAD 15 +) without having the actual modeling software. Features I really like are the insanely simple Joystick navigation, fly mode, pinching in and out (like when viewing images on iPad) to “zoom” into the model - effectively quickly transporting to that point - and “Gravity-mode” that keeps you on the ground, making it much more realistic in a “first-person shooter”-like way. Abvent’s companion app to its highly successful standalone rendering software “Artlantis”, iVisit 3D is more a design visualization tool, rather than a navigation app for 3D models. It’s a tool focused towards architects and designers mostly, as after creating them using Artlantis Studio 4, you can export the model with specific rendered panoramas. Available in two versions, Lite and Pro, the former is completely free, but limits the ability to view one panoramic model per day. As with most iPad viewer apps, iVisit 3D allows sample models to be downloaded directly from within the app, letting you get stuck in quickly to explore some panoramas in full rendered glory. One of my favorite features is definitely the option to physically move the iPad to rotate through the panoramas. 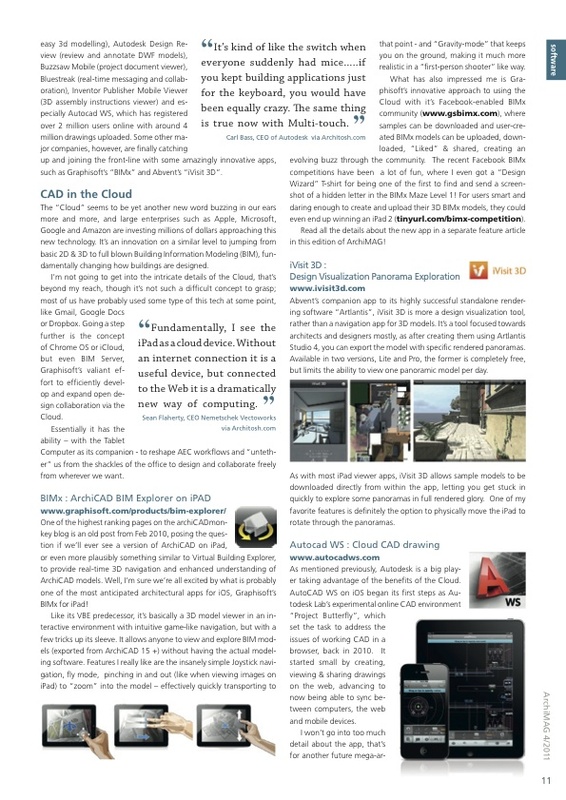 As mentioned previously, Autodesk is a big player taking advantage of the benefits of the Cloud. AutoCAD WS on iOS began its first steps as Autodesk Lab’s experimental online CAD environment “Project Butterfly”, which set the task to address the issues of working CAD in a browser, back in 2010. It started small by creating, viewing & sharing drawings on the web, advancing to now being able to sync between computers, the web and mobile devices. I won’t go into too much detail about the app, that’s for another future mega-article, though some of the best features are the ability to open DWG and DXF files, add text notes and revision clouds, accurately drawing shapes and measuring distances, and especially offline access to your files. Definitely worth a try! Augmented Reality is one of the newest innovations in tech; it’s essentially the superimposition of graphics, audio and other sense enhancements through a display onto the real world, thus “enhancing” our reality. One of the more impressive apps to hit the App Store this year is SightSpace 3D , a great app for architects and urban planners allowing you not only to view your SketchUp models on iPad, but also to see them directly superimposed on the real world through the iPad 2 camera in real time! Just point the iPad to face the proposed site and see the 3D model come to life directly on the land, while adapting to your motion around the real-world site. The evolution of tech is always difficult to predict, I mean who’d have thought 10 years ago we’d be using Tablets and Smartphones that mimic tech we’d only ever seen on Star Trek! But it’s always fun to dream, and there are loads of great ideas for future products and technologies, plus some hints of what's just waiting over the horizon. These are some of my favorite rumors and concepts of the future of CAD and 3D technology. It seems that 3D movies are all the rage again, not since their introduction in the 1950s, with their snazzy blue and red stereoscopic glasses, has there been so much interest in them, a fact most probably due to the success of James Cameron's "Avatar". Ok, there might be a theme here, but some of the most interesting patents are surfacing from Apple, including this one that has to do with 3D head-tracking technology, basically Glasses-free monocular 3D on a display. The logic is that an embedded front-facing camera (like on the iPhone 4 / iPad 2) with face-detection would be able to track the user’s movement and adapt accordingly, creating a sense of even more 3D realism for objects and spaces by adding spectacular virtual depth and enabling more possibilities of interaction. Homestyler is Autodesk’s very simple 3D home, interior & garden design web app, meaning that it all runs in your browser. Seen as Autodesk has had so much success with their other web app, Autocad WS, why not do the same with this one? The only hurdle to overcome is that it’s a Flash-based application at the moment and, therefore, cannot run on iPad. Using it online though, it’s very simple to create spaces and fill them with furniture, add doors & windows, rearrange layouts and add landscape without any CAD knowledge necessary, making it a great tool for CAD newbies or non-professionals, though architects and interior designers will find the ability to export to Autocad and Revit very useful; this creates the ability to quickly conceptualize in Homestyler and then develop the design further in CAD + BIM apps. Imagine having this ease of designing directly on an a Tablet while sitting in the room you want to develop or decorate, render it in front of your clients, and then sending it to your laptop to finish up the technical details. What about Autodesk Photofly for iPad? If you’ve seen what Project Photofly can do, you’d think as I did the first time, “awesome piece of software, but how is it possible it isn’t already in phones and tablets?!”. The app allows anyone with a digital camera to create near accurate 3D models from photographs using the web, harnessing the power of Cloud computing to translate photos into detailed 3D models. It currently can export the models to iPhone/iPad, to be viewed with Autodesk’s Inventor Publisher Mobile Viewer. If a complete creation & viewer app could be developed, what more perfect tool to hold in your hands while on site; to make a detailed scan of the surrounding area, or even make a quick 3D survey model of elaborate structures. A 3D sketching system being developed at the University of Toronto is described as an “as-natural-as-possible sketching system for creating 3D curve models”. A while before all the hype of mainstream Tablet Computers, some great minds over at the Department of Computer Science of Toronto University developed a system giving the ability to “sketch” in 3D space while using a tablet-type device. “ILoveSketch” is a 3D curve sketching system that brings the benefits of drawing like pen on paper, while automatically creating a concept 3D curve model. It’s a really clever system integrating traditional sketching techniques and user interaction with a 3D model in novel ways. This isn’t just two-dimensional sketching, but an evolution of a kind using NURB-based geometry to create freeform shapes via curves of high precision and great ease. ILoveSketch takes advantage of multi-stroke sketch techniques and gesture-based functions to create groups of these curves while drawing with a Stylus-type pen. “I Love Sketch” could become a great asset to industrial designers to rapidly draw up 3D concepts , though you can easily see it being used for conceptualizing architectural forms and complex designs before moving onto CAD or BIM apps. As SketchUp revolutionized quick & easy modeling to a point where nearly anyone can draw in 3D, this kind of system could do the same with virtual sketching methods, as sketching is more natural than using a mouse and requires less training to get the hang of. If this sort of system could become integrated somehow into a powerful multi-touch surface like the iPad, it could change the designer’s workflow dramatically. The Hidden Creative has envisaged many more ways of how the future will be flooded with Augmented Reality, and have conceptualized how a Tablet device may be used to help architects, interior designers, or even realtors and furniture stores. Imagine an IKEA catalogue app that lets you place virtual furniture directly in the room you’re redecorating, change colors of the walls, and add light fixtures that interact with the virtual objects and the physical space. Ok so it’s not exactly an iPad concept, but this could be rather revolutionizing, and plausibly integrated into future releases. The industrial designer Tommaso Gecchelin (tinyurl.com/mac-2020) has envisaged a future Macbook, which takes advantage of the progress of nano-technology, photovoltaic power, and ultrasound waves to provide tactile feedback, as well as holographic technology which captures & emits 3D images. It's a brilliant concept, which could really bring digital images to life, and the ultrasound feedback could let you literally feel the holographic objects in front of you. Hopefully in the not so far future we’ll see what some of these guys can come up with - though one thing’s for sure, CADmonkeys of the world are itching more than ever to see what’s boiling in the iPad pot and what new concepts Apple’s future releases will spark, as the iPad evolves into a serious companion tool in business. New features in the next AutoCAD WS? Will Archicad be the first true CAD app on the iPad?